The vanguard of the Viva Palestina entered Gaza yesterday. Others wait on the Egyptian side to be 'processed'. But there is great joy. BREAKING THE SIEGE- THE BEGINNING OF THE END? In Gaza City, it was jubilations and celebrations tonight where the guests of honour did not want to be considered as guests - but as part of the ever-growing Gaza family. 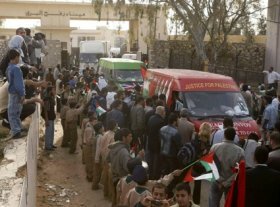 The Gaza authorities have organised a rally in honour of Viva Palestina and a program of activities that includes a tour of the damaged areas including schools, hospitals and other amenities.